Work began on harvesting at Gateway Woodland 5 June and is now into the final few months. 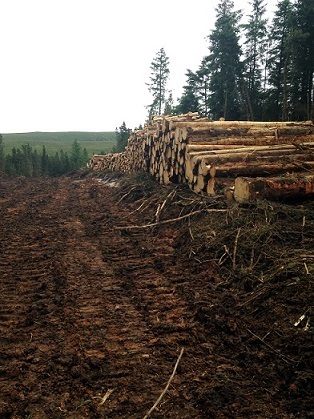 78ha of lodgepole pine and SITKA spruce will be cleared and in their place, 42ha of broadleaf woodland will be planted..
Two haulage trucks per day are extracting the timber. They are taking great care to cause minimal disruption to the roads and community and this seems to have been successful to date. 13,000tn of timber will have been harvested from Gateway Woodland, 300tn of which has been set aside for Community Company use. Planting of the saplings will take place Spring 2015, and the project will be complete by July 2015. An access route has been laid through the centre of Gateway. When work is complete, this access route will become a trail for public use, linking up with the network of paths throughout the estate. The clearing of Gateway Woodland has opened up a landscape and a view that has not been seen for over thirty years.